Diabetes in Cats. Home Page and links to other pages. What my cats taught me about feline diabetes. 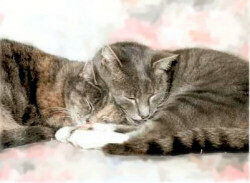 That’s my two diabetic cats in the photo, Paris and Tatty. Between them, they gave me more than seven years experience dealing with diabetes on a day to day basis. Everything on this site is the result of that experience. I’ve included sections on injecting insulin, home blood testing your cat, ongoing feline diabetes monitoring, and other feline diabetes sites you should find helpful. Just choose a subject from the menu which you will find on the left hand side of every page. Don’t be overwhelmed by the amount of information on this or any website. This site concentrates on one small aspect of our lives - the diabetes part. This site isn’t about what we did the rest of the time - which in Paris and Tatty’s case included sleeping, eating, sitting in the garden, watching the world, normal cat stuff! If you know something I don’t or would like to see something added to this site, please let me know and I’ll do my best to oblige. Just know this: diabetes is not a death sentence. In the beginning it was frightening, frustrating and I really did wonder if deciding to treat my cats was the right decision. I now know that it was. Yes, diabetes is a serious condition, but it is more than possible to give your cat a quality life with this illness. Ultimately, I think it’s the most rewarding thing I’ve ever done. It’s not every day you get to save a life.